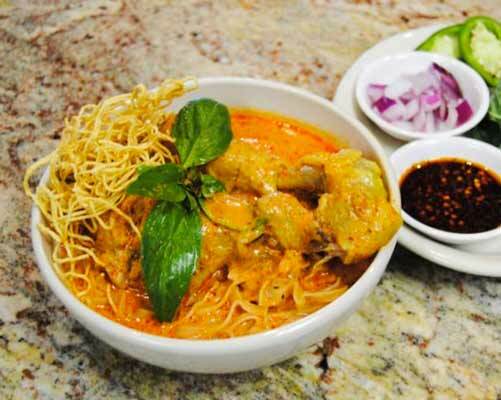 Research has shown the health benefits of many of our traditional Thai ingredients. The dishes below contain delicious combinations of these and other beneficial foods. Prepared with choice of meat or meatless with tofu. Fresh butternut squash and green beans sauteed in red curry sauce with onion. Wild Pacific salmon, tomato, broccoli, cabbage and onion stir fried with garlic and ginger in a robust tamarind and turmeric sauce. 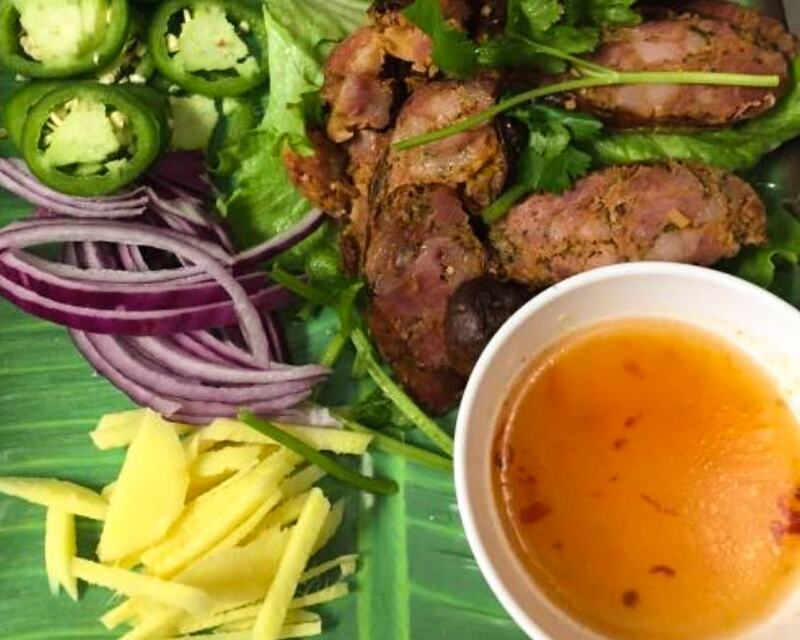 Noy got this sauce recipe right out of a Koh Samet beach front kitchen. Fresh vegetables stir fried with savory lemongrass in garlic and chili sauce. Thai style fried rice with eggs, onions, broccoli, tomato, carrots and pineapple chunks all stirred with turmeric and dark soy sauce. Choose mild, medium or spicy. Soothing, nourishing spicy chicken wonton soup with healthy doses of garlic, ginger, chili peppers, celery, carrots, leafy greens, cilantro and herbs. Topped with fried fresh garlic. In honor of our king! We give our already savory fried rice the royal treatment melding jumbo shrimp, yellow curry, eggs, Sri Racha sauce, onion, sweet yam (seasonal), tomato, broccoli, carrots, pineapple and cashews. 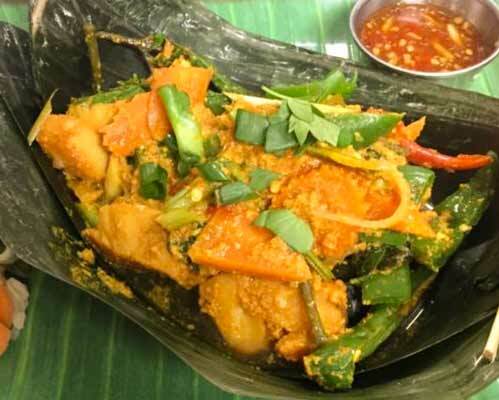 Tender Cod fillet steamed in banana leaf with garlic, lime, lemongrass and fresh garden herbs. 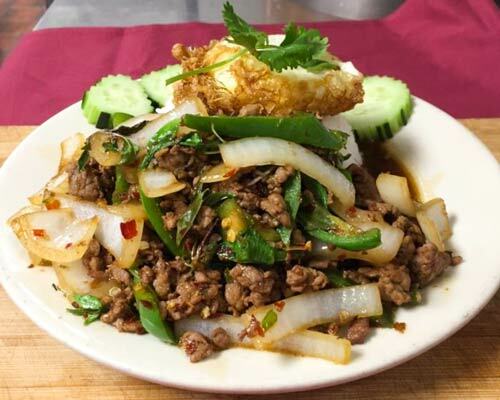 Country style Kra Prow stir fry with chopped chicken or pork stir fried with basil onion jalapeno. Topped with refreshing cucumbers and a fried egg. To avoid confusion, please indicate clearly that you want the "Gluten Free" version of an item from this menu. Traditional old northern recipe! a crispy, crunchy burst of flavors. Rosted peanuts, shredded coconut, thinly sliced ginger, dried shrimp, bell peppers, onions, and lime all vie for a place on a bed of lettuce leaves to be topped off with sweet galanga sauce. Soothing Thai home remedy! Chicken and rice soup with fresh ginger, onion and cilantro topped with fried fresh garlic. Seasonal fresh vegetables sauteed in spicy red curry sauce (no coconut milk) with onions and bell peppers. Sorry, cannot be made less spicy. Chicken sauteed with onions, bell peppers, pineapple Chunks, seasonal fresh vegetables and cashew nuts. Tender slices of chicken sauteed with fresh ginger, onions, green bell pepper and seasonal fresh vegetables. Fresh eggplant sauteed in spicy red curry sauce (no coconut milk) with onion. Hot and Spicy! Choice of meat sauteed with strips of chili pepper and bamboo shoots. Sorry, can not be made less spicy. Thai style fried rice with eggs, onions, broccoli, carrots, pineapple chunks and tomato with dark soy sauce. This typical Thai street dish is a spicy mix of fried rice with eggs, basil, garlic, onion, chilies, broccoli, carrots and cabbage. Cool and spicy Northern Salads mixed with chili, onions, shredded carrots, cucumber, roasted rice powder and tangy lime garlic sauce topped with mint leaves, scallions and fresh garden herbs. Tender sliced char broiled beef. Fresh green papaya salad with carrots, roasted peanuts and dried shrimp. Spicy mango and jumbo shrimp mixed in a tangy lime, chili, garlic sauce with peanuts, ginger, tomato, cucumber, onion and fresh garden herbs, Topped with roasted coconut. Wok fried wild pacific salmon (seasonal) mixed in a mouth watering lime, chili, garlic sauce with fresh mango, celery, cucumber onion, ginger, fresh herbs and cilantro. Served with sticky rice. Wok fried whole fresh fish topped with Lime, Chili, Garlic & Garden Herbs.